Both Capt. Mike and Myself were happy to participate today in the Wounded Warriors Fishing Event being hosted by both the Swansboro Rotary Club and the Crystal Coast Fishing Association. The plan for the day was to get all the soldiers onboard around 7am and have everyone back to the dock around 11:30 so everyone could converge upon the Swansboro Civic Center for a Catered Lunch. There were just over 20 Soldiers and 18 boats that volunteered. Mike had James Reed onboard while I had John Beaver onboard. John and I went out along the beach looking for whatever would cooperate. It got very choppy and we came back near the inlet where we met up with Capt. Walter Bateman and got on some Albacore. We then went into the backwaters to get away from the rough water. With only 2hrs of fish time left, we quickly worked several bays in search of a redfish. Despite the 15mph winds, we finally hooked up with a very nice 26in redfish on a topwater bait. This fish was a solid 7lb red. 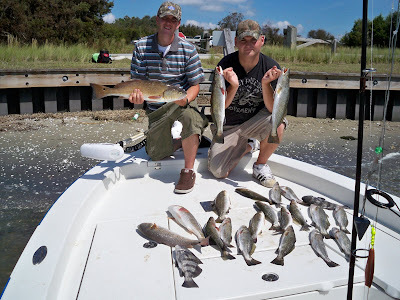 Shortly after we got a call from Mike and he said they were on a solid speckled trout bite... so, we up and left our area and met up with him with just enough time left to put a couple in the boat. Mike, on the other hand had been wearing them out all morning and had a mess of trout and a couple reds. Lots of fun today. To all our soldiers, we appreciate the sacrafices you make for us and our nation. Know that you are always in our thoughts and prayers. Mike and I, as well as all those members of the Swansboro Rotary and the CCFA were proud to be able to add a little joy to your day. Take care, and God Bless you and your families.